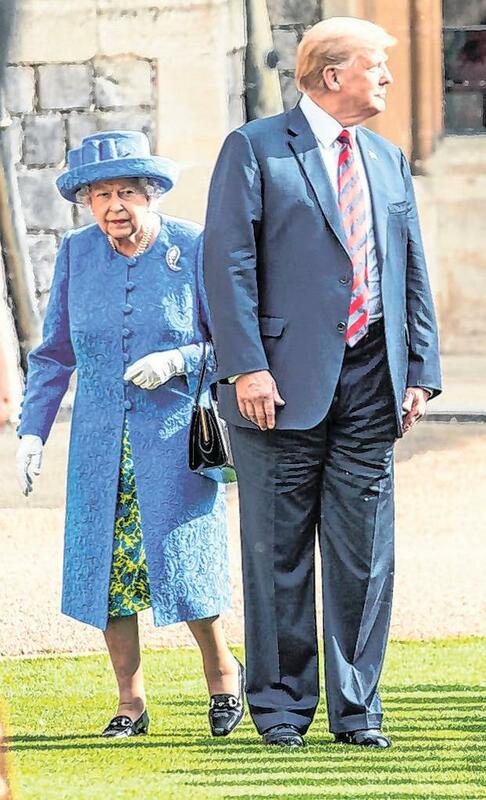 Donald Trump has rejected reports he was late to meet the British queen as “fake disgusting news”, explaining that it was actually she who made him wait. The US president also dismissed claims he overstayed his welcome during the royal encounter at Windsor Castle last month. The comments came as Mr Trump renewed his campaign against the media at a Pennsylvania rally, during which he denounced the press for underselling his accomplishments and doubting his political rise. “I was asked to have tea with the queen, who is incredible by the way. Incredible,” Mr Trump told the crowd. The president said he then went to have tea with the queen. “And I didn’t know this – it was supposed to last 15 minutes but it lasted like an hour. Because we got along. And she liked our first lady and our first lady liked her. “But we got along fantastically well. “But the time went by – you know, sometimes you get along and the time goes by. “So here was the story by the fake news: The president was 15 minutes late for the queen. Wrong. “So they said I was late when I was actually early, number one. Number two, I guess the meeting was scheduled for 15 minutes and it lasted for almost an hour. The president overstayed! Next articleBreastfeeding: Why are we squandering a natural resource that benefits us all?